When my cousin was about 12 years old, she knit me a scarf. I’m touched by this gesture every time I think about it. That’s a lot of time and effort to put into an object for someone else when you’re that young. The scarf (at left) is great, made from a colorful thick-and-thin yarn, but it’s kind of short. Then one day a couple of years ago I realized that if I added buttons and buttonholes to the ends, it could be a stylish cowl, and I’d probably wear it a lot more. 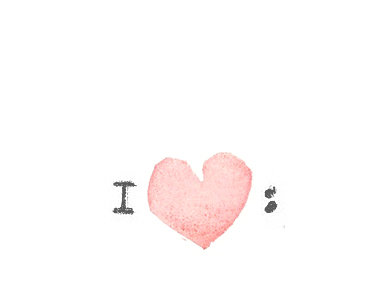 Which I do. Then I realized that a cowl like this, just a knitted rectangle with buttons added, would be a perfect second or third knitting project for my students. For when you can knit and purl, but maybe you’d like to make something besides a washcloth using your current skills, before moving on to knitting in the round and all that. 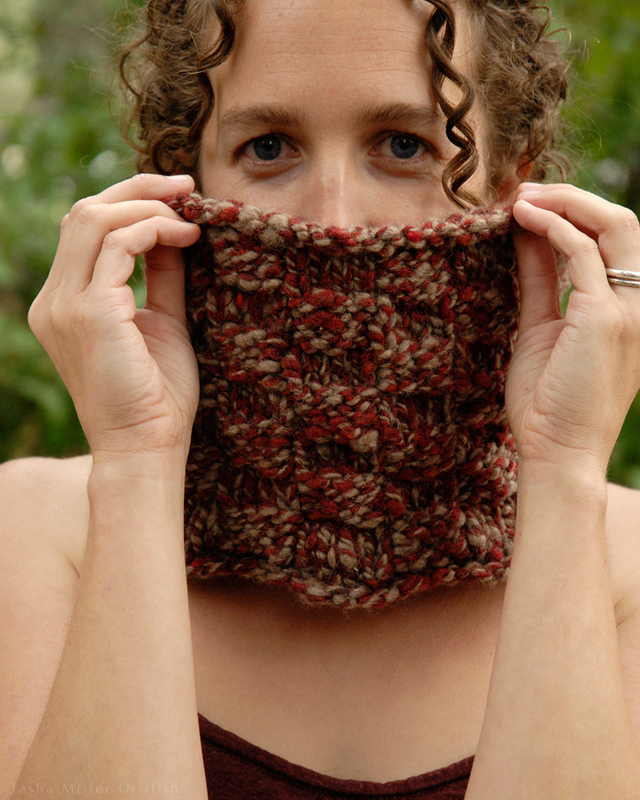 To make this cowl, you’ll knit a long rectangle, and then use a simple crochet stitch to make buttonholes on one end. Sew buttons on to the other end, and it’s ready to wear! This concept is very adaptable. It’s easy to vary the yarn, stitch choices, and size to suit your own taste and knitting level. Yarn: the sample is made in Cascade Baby Alpaca Chunky, a very soft yarn with a lot of drape and not much bounce. 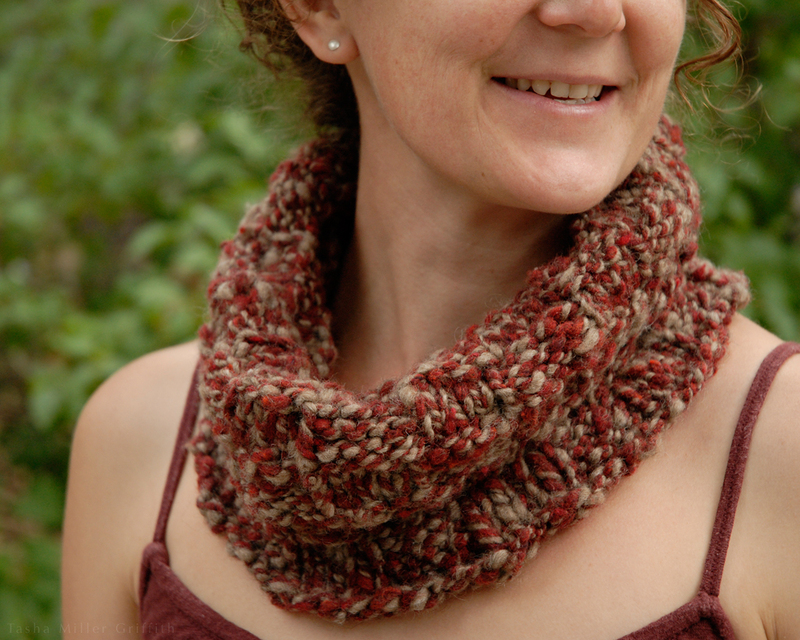 One skein is enough for a small cowl like this. The finished fabric hangs in liquid folds. 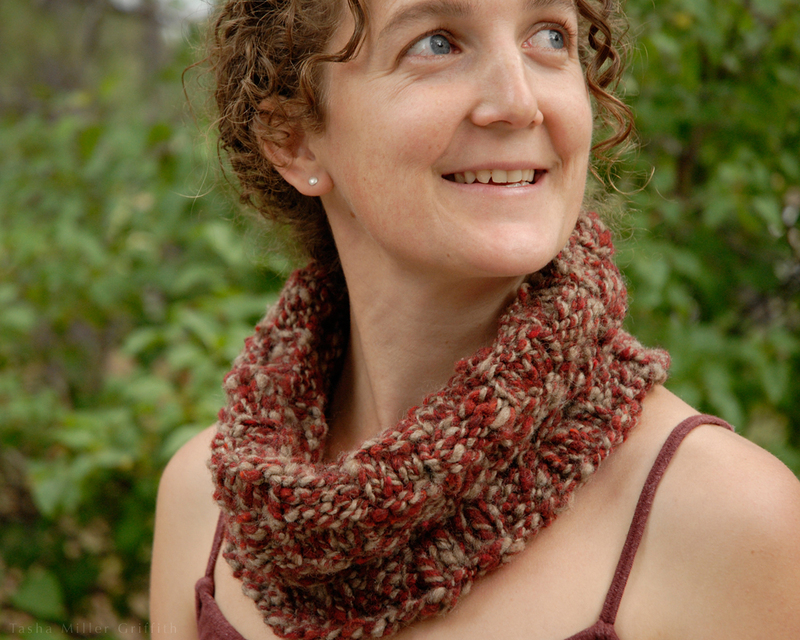 If you’d like a cowl that will stand up more, choose a yarn with more body and spring. Gauge: the finished sample has 4 stitches per inch in both stockinette and seed stitch. It’s OK if your gauge comes out a little bit differently, since exact size isn’t super important for this project. It’s still a good idea to make a swatch with your yarn and see if you like how the fabric is coming out, and measure your gauge to get an idea of how big your finished cowl will be. Needles and Hook: try US size 8 (5mm) knitting needles, but keep in mind that you may need a larger or smaller needle to get the gauge you want (especially if you use a different yarn). You’ll also need a crochet hook in a similar size for the buttonhole loops. In my experience the hook size doesn’t need to be exactly the same for such a small section. Finished size: the sample cowl is 8 ½“ wide and 22 ½” long. It fits fairly close around my neck, but is big enough to get over my head without undoing the buttons. You can compare the dimensions to any cowl you like to see if this seems like a good size for you. 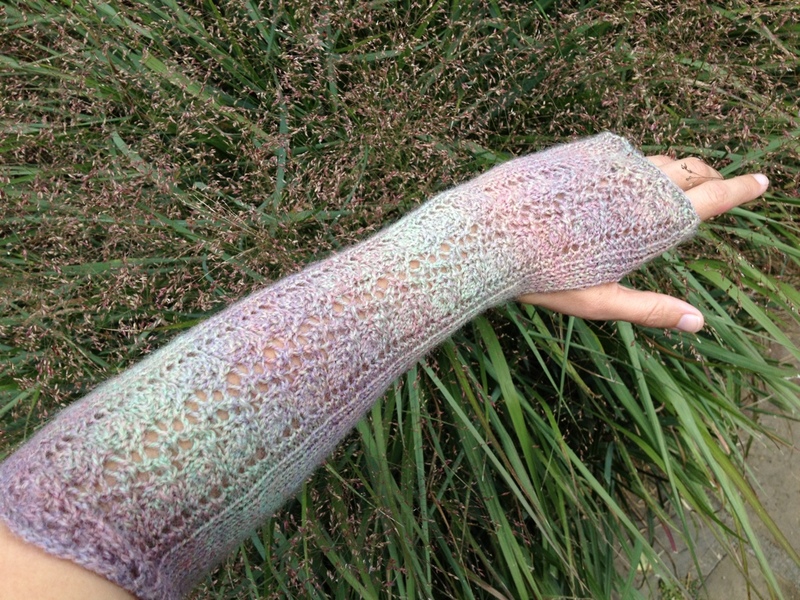 Cast on 35 sts (or your stitches per inch x desired size in inches). For the seed stitch pattern, you’ll need an odd number of columns of stitches. In the sample cowl, there are 7 columns of 5 stitches each. You can also vary the number of stitches in each column if that works better with your stitch count. First row (right side): work in seed stitch for 5 stitches (knit 1, purl 1, knit 1, purl 1, knit 1), and then knit 5 stitches. Repeat this sequence of 10 stitches (2 columns) two more times, and end with 5 stitches of seed stitch. Note: You may want to put a stitch marker around the needle between the sections to help remember when to switch patterns. Second row (wrong side): work seed stitch for 5 stitches (knit 1, purl 1, knit 1, purl 1, knit 1), and then purl 5 stitches. Repeat this sequence of 10 stitches (2 columns) two more times, and end with 5 stitches of seed stitch. Note: this seed stitch in this pattern alternates every stitch between knit and purl, both horizontally and vertically. After set up in the first row, work a knit stitch on top of each purl stitch you see in the seed stitch sections, and vice versa. Repeat these two rows until you reach your desired length for the cowl. Bind off—not too tightly or the edge will pucker. Leave a long tail (a couple of feet long) and you can use it to make the buttonhole edge as well. Go into the first stitch of your bind-off with a crochet hook. Pull a small loop of yarn through with the hook. Go into the next bind-off stitch the same way, pull another loop through, and then pull the second loop through the first loop so that you have only one left on the hook. Continue in the same way, going into each stitch as you come to it, pulling a loop though it and then through the loop you already have on the needle. This is called a “slip stitch” in American crochet terms. You’re making a line of crochet stitches, which should look like another bind off row on top of the first one. When you get to the place where you want to make a buttonhole, chain (pull loops through your working loop one at a time, without connecting to anything else) until you have enough stitches to just fit around your button. You can make the buttonholes flat to the edge or more of a loop—your choice, depending on where you attach them—but either way they should be just big enough to push the buttons through, otherwise they may come loose while you wear it. Reattach the chain to the edge by going into the bind-off stitch you choose, and making a slip stitch as you did before. 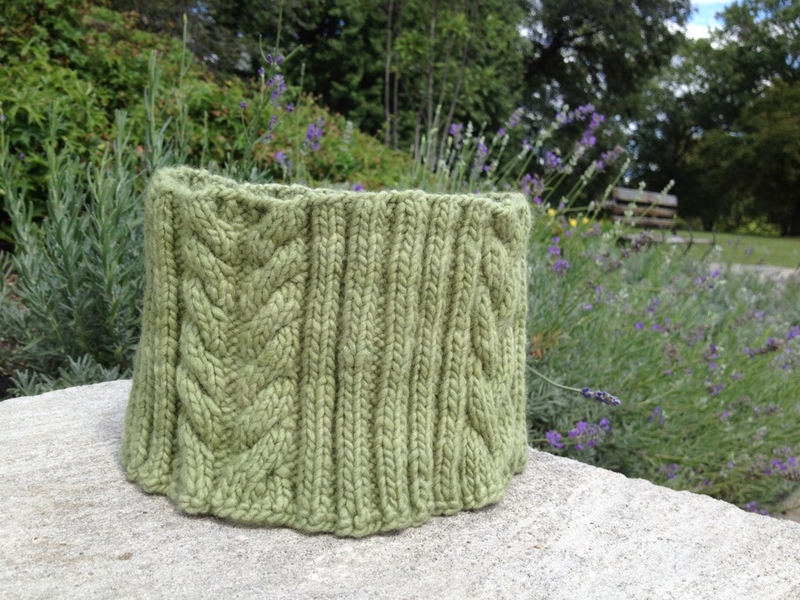 The sample cowl has three large buttons and buttonholes, which line up with the three stockinette stitch columns. Sew on your buttons to line up with the buttonholes. I use the same method as I do with sewing thread, except the yarn only goes once each way through the buttons since it’s so thick. Enjoy! If you make one, I’d love to see it. Here’s what I made with that first batch of my handspun yarn. And how to make something similar yourself, if you’re interested! I really wanted something simple, that would let the (ahem, very thick-and-than-thin) nature of the yarn shine through. But, I’m not a knitter who’s happy with endless rounds of stockinette. No offense to those that are, but I just need a little something pattern-wise to keep my brain engaged, and let me see that I’m making progress. My gut-instinct guess was that I’d have enough yarn to make a small but substantial cowl. Of course, there’s no label on my handspun to let me know the yardage, but I was able to estimate how much knitting I could get from the yarn pretty successfully. I knit a swatch in my pattern, measured the dimensions, and weighed it, so I knew about how many square inches of knitting I could get from a certain amount of yarn by weight. Then I weighed all the yarn I had, and used that number to figure out about how many square inches of total knitting I could make from it in this pattern. I tried on a cowl I had, and estimated how big it would need to be to comfortably fit over one’s head, and how tall I would ideally want it, and arrived at a compromise number to cast on. The finished cowl is 25″ around, and 7″ tall, which turned out to be plenty big! At my gauge of 2.5 stitches/inch, I cast on 64 stitches. I used Jeny’s Stretchy Slipknot Cast On. (In this yarn—yes really! More about that here.) I did two rows (or maybe three? Forgot to write that down …) of plain knitting to make a little roll at the bottom, then switched to my pattern; alternating blocks of four knit and four purls stitches, and switching them after 4 rounds. 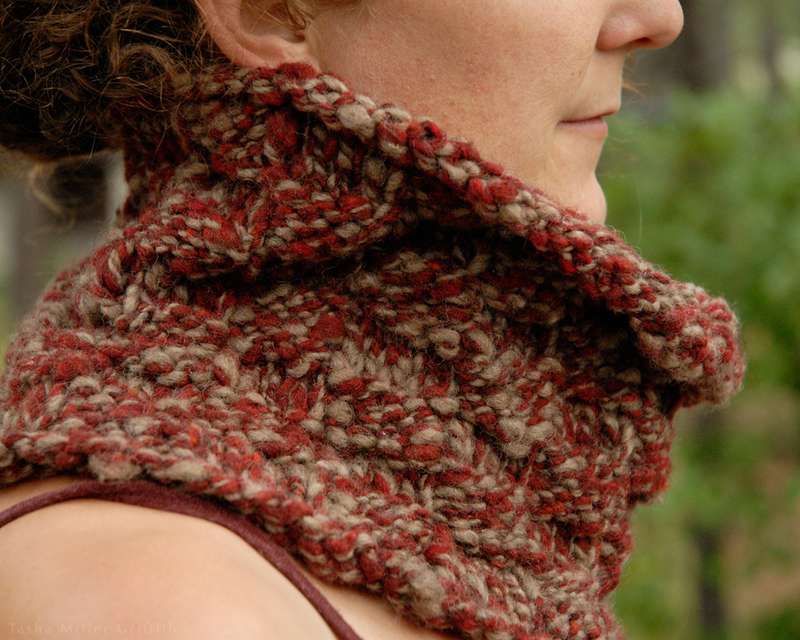 Of course you could use another simple pattern for the body of the cowl. Just make sure that the total of your pattern repeat (in my case 8 stitches) divides evenly into the number of stitches you cast on. When I was getting near my estimated total height, and at the end of a pattern repeat, I knit a couple more plain rows, and then bound off, using Elizabeth Zimmerman’s sewn bind-off. I ended up using almost every bit of the yarn, which was definitely my intent! I almost never buy yarn this chunky, so it seemed like the whole thing took about 5 seconds to knit. In reality, it took parts of two days of traveling, and it was done! So far, it seems like spinning is actually speeding up my production of finished knitted items, if that’s possible. I actually have another finished handspun thing that just needs photos … and this one is off to live with someone dear to me, hopefully it will keep her neck warm this winter! thicker yarn, whether made by you or not! I started knitting a lot when I started traveling a lot with Bryan. 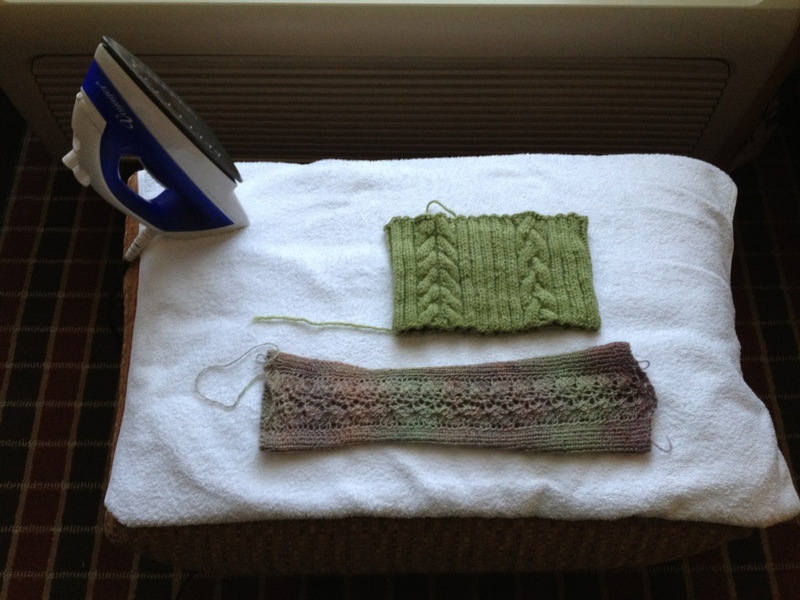 Probably my favorite thing about knitting is still its versatility and portability – how one little bag of supplies can become a garment, and maybe more importantly, provide me with my “make something” fix anytime, anywhere. On this trip so far I’ve been working on samples for two new classes I’m teaching at my local yarn shop this fall; a cable cowl based on the way my friend Birgitta taught me to knit cables, and lace fingerless gloves from a Churchmouse pattern. Morning light on my hotel room blocking. I neglected to bring pins, so steaming and stretching had to do for the lace. If I wet & pin it at home, I’m pretty sure I can get a little more openness in the leaf lace pattern. I’m definitely indulging my romantic side with these mitts. A student asked me, “But would you wear that?” “Yes,” I responded, “but I do agree that ‘would you wear it?’ is an important question to ask before you start knitting!” What I’ll wear them with is another question . . . This yarn is Jojoland Melody. The yarn for the cowl is Manos del Uruguay Maxima. I love Manos, and this one is dreamy soft with subtle color variations – a sure way to get my attention! I’m also pretty excited about teaching this class, since Birgitta’s design is set up to make it easy to customize, meaning I can talk about how to play with size, gauge & placement as well as how to make cables! 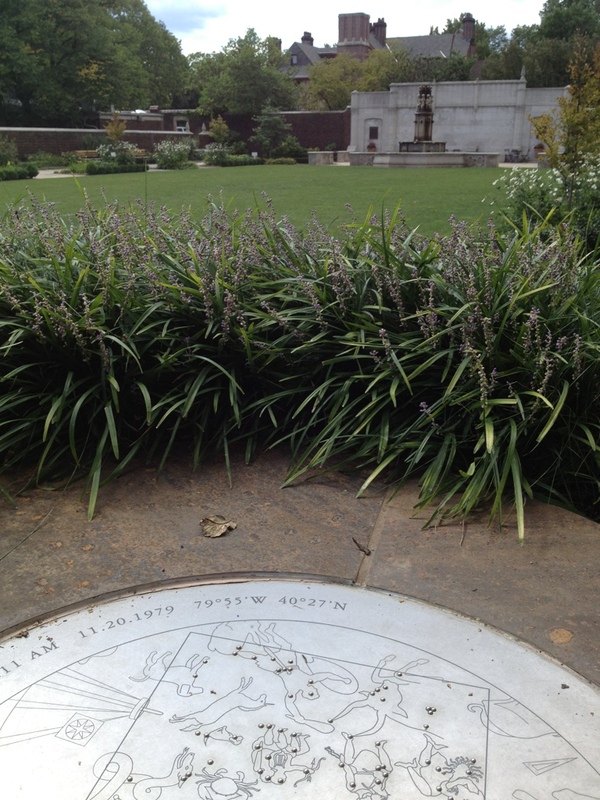 Very special thanks to Mellon Park in Pittsburgh for the backgrounds in this post, as well as being a really lovely spot!